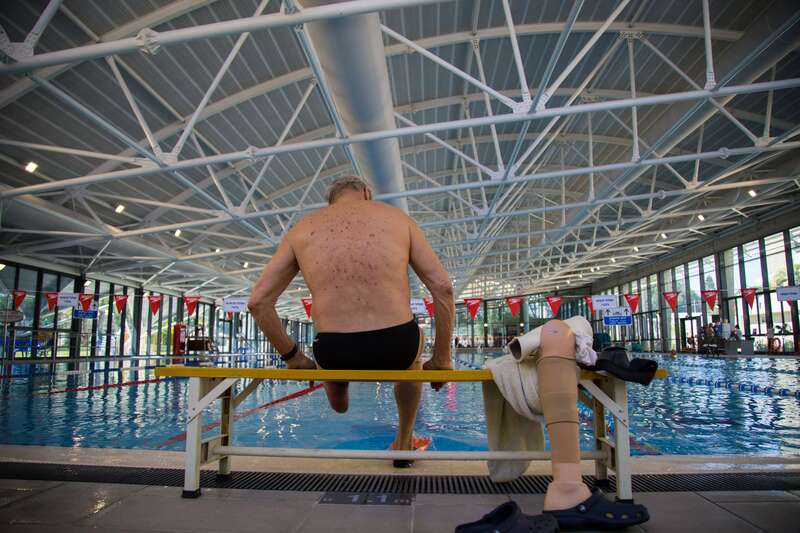 After twenty months of extensive construction and renovation works, one of the most modern swimming and rehabilitation facilities in Israel has been inaugurated at Tel Aviv’s Beit Halochem Rehabilitation, Sports and Recreation Centre. The Olympic Pool and state-of-the-art Hydrotherapy Pool are in full operation. The Paralympic swimmers have returned to training at their home pool just in time for the Rio Olympics this coming September, disabled veterans are enjoying the new pool for their recreational swimming and their families are happy to be back with them now that school’s out. The new Hydrotherapy Pool is providing over 1500 rehabilitation treatments a month to disabled veterans – triple the previous capacity. Additionally, the specialized equipment, such as the underwater treadmill and platform that allow patients with weight bearing issues to comfortably rehabilitate their walking while reducing the stress on their bodies, is helping numerous disabled veterans regain strength, flexibility and mobility. The warmer water temperature in the hydrotherapy pool allows for optimal rehabilitation for the veterans and provides a comfortable work environment for the therapists. Architecturally, the aquatic complex of pools and the unique aluminum-ribbed domed roof covering the whole facility are truly exceptional. The entire centre, featuring a “green” energy conservation machine room with a chiller (heat recovery) facility, provides energy for both pools and the main building, reducing the Tel Aviv Beit Halochem energy costs by nearly 75%. A Wall of Honor was erected at the entrance to the new pool complex. On it are recognition plaques honoring those individuals, foundations and organizations whose support, true friendship and partnership enabled this magnificent project to become a reality. The Zahal Disabled Veterans Organization is deeply indebted to them for their magnanimous generosity and kindness. We invite you to come and visit the beautiful new complex when you are next in Israel. Build a supportive atmosphere, which will help the disabled veterans resume their normal lives as quickly as possible. Foster the full reintegration of the veterans into society by establishing sports & rehabilitation centers, offering a comprehensive range of services. By setting challenges and daily targets, both physical and mental, it aims to restore a better quality of life. Safeguard their legal rights and promote their interests through legislation or economic and social measures.